Normally, Palo Alto companies buy European ones, but sometimes there are exceptions. Case in point: today OverBlog, a leading blog platform in Europe with over 32 million uniques according to comScore, is announcing it has acquired Timekiwi, a tool that helps you make a timeline using your social media postings. Terms of the acquisition were not disclosed, but OverBlog says Timekiwi will be integrated into its platform by summer 2012. 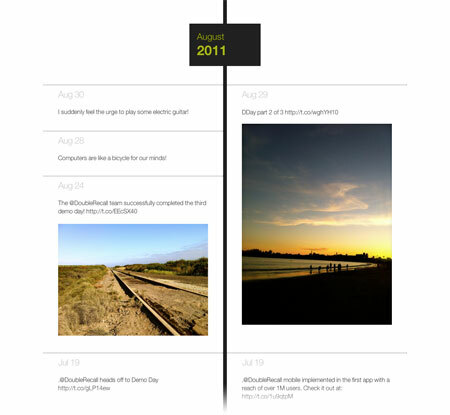 For those unfamiliar, Timekiwi allows users to create attractive timelines (no relation to Facebook’s new Timeline feature) using posts from Twitter, Facebook, Instagram, Foursquare, Flickr, Tumblr and, of course, OverBlog. The Palo Alto-based startup was founded in 2010 and launched in the fall. But it has flown under the radar, picking up just 5,000 registered users to date. Says OverBlog founder Frederic Montagnon (also the Director of Strategy at ebuzzing, the company that owns OverBlog), the acquisition was more for the technology in Timekiwi than it was for Timekiwi’s audience. Nor was it an acqui-hire, as the Timekiwi founders, Miha Rebernik and Robert Farazin, will not be joining the OverBlog team. Ebuzzing, which raised $25 million in August 2011 following a rebranding from its former name, Wikio Group, saw revenue of $15 million in 2010. In 2011, that figure almost doubled, says Montagnon, and the company expects it to double again in 2012. OverBlog had already been working on a similar concept for its blogging platform, so when it saw the Timekiwi technology, it decided to acquire the tech instead of continuing to build from scratch. Timekiwi will be a feature in the new OverBlog release which is planned for this summer.